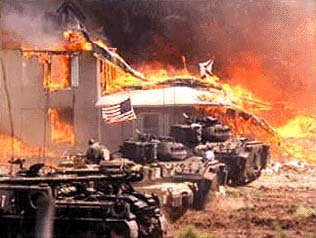 BRANCH DAVIDIAN COMPOUND, WACO TX. Waco Mass Murder vids The only thing worse than the slaughter of men, women and children, is the on-going cover up. The scene I’ve written about so often is titled “ATF agents raiding Waco Compound” which looks more like a rambling farm house to me. (See right hand column.
) It is a little chopped up. The original uncut version showed the 4 agents climb on to the roof. One takes a defensive position at the peak of the roof while the other 3 go thru the window. After the 3rd guy enters the room, the first agent goes to the window and drops something into the room they just entered. It appears to be a smoke grenade. He then sprays the room with machine gun fire. There is some return fire coming thru the walls. Note: the window they were climbing thru was that of David Koresh’s bed room, not a 2nd floor "arsenal" (with a window). Of all the vids I’ve seen, this is the only one claiming the agent got shot in the shoulder. One claimed he took a bullet to his foot.